After a brief reviewing hiatus at Fantasia to try and keep my sanity intact, I’m back. For the past few days it has seemed like I’ve been picking the wrong screenings. I’ve seen some mediocre movies over the past few days, but nothing really good. As usual, it always seems to be the movies that I know nothing about, and therefore have no expectations for, that seem to be the winners. 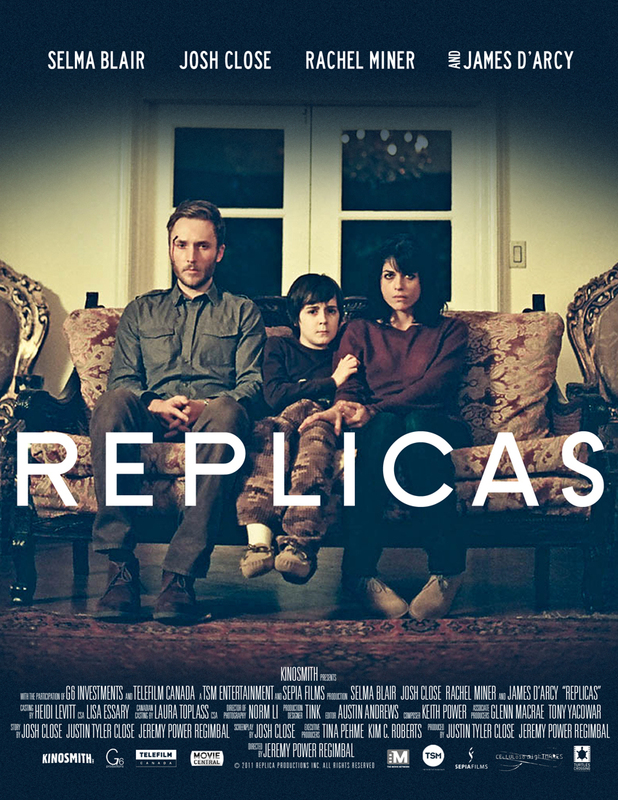 Replicas, the directorial debut from Jeremy Power Regimbal, pleasantly surprised me and was filled with cleverly written dialogue and excellent acting anchored in an environment filled with off-beat comedy and bizarre social situations. Mark (Close) and Mary (Blair) have retreated to a lovely forested home with their son in order to escape a world of hurt. Not long ago their young daughter died in a tragic accident and the wound has never healed. Not only do Mark and Mary miss their daughter every day, but they are finding themselves drifting apart emotionally. Their stay at a beautiful vacation home is a last effort to try and grow close again, in addition to giving them the peace and solitude needed to heal as individuals. Unfortunately for them, the neighbours happen to be bizarrely intrusive and incredibly socially awkward. After the neighbours invite themselves over for dinner, the reluctantly budding relationship between the two families takes a dark turn and the sensitive details of Mark and Mary’s loss and struggling relationship are on display for all to see. Replicas is a very impressive debut for Regimbal, particularly concerning the beautiful visuals found throughout the film. The story calls for fairly generic locations: a house, a forest, a bridge, but the actual locations selected, particularly the house, are gorgeous to look at. Of course the very professional photography certainly plays a role in making these locations pop off the screen onto our retinas. Replicas is most likely a low budget movie, but you would never guess it from looking at it. The performances are also quite impressive. Blair and Close are great in the roles of a devastated mother and father, but my favourite performance had to be the deliciously quirky one turned in by James D’Arcy as Bobby. Although D’Arcy may be the best at it, the entire cast of adults all seem to have their fingers on the pulse of the awkwardly comedic dialogue exchanged as the two families get acquainted. The script is incredibly well-written in terms of dialogue and pacing, setting itself up for something very original but eventually settles for the everyday, at least as far as the film world goes. My biggest problem with Replicas was the direction chosen for the plot. This is not a technical criticism, more of a storytelling one. Despite the hugely entertaining dynamic between the ‘normal family’ and the ‘crazy family’, the filmmakers decided to follow a certain twist early on in the movie which felt a little safe considering the unusual first 30 minutes or so. I understand that the filmmakers had a specific story in mind, I just wish they could have been a little more daring. However, with a directorial debut it’s hard to fault Regimbal, as Replicas is very funny, entertaining, twisted, and has an exceptionally professional feel to it. One of the best movies I’ve seen at Fantasia 2012, Replicas is recommended for the wonderfully original first segment alone, although the entire film is certainly worth your time. Quinn Lord, the twee child actor got an amazing role. I´ll see this film.